An Arc speciality, one that applies to all our work, is helping the people to see things in new, interesting and useful ways, equally important in a successful masterplan or a truly engaging public project. Reinterpreting the things or places we take for granted, giving people new ways to connect with nature on their doorstep… it’s this that has inspired many of the events and activities we have invented or run throughout our respective careers, Sandman Snowman, The Hive at the IW Festival, Big Bug Day and Pan Park Safari. It’s also this which gave rise to our annual event, Under The Pier, so successful it’s got its own microsite ! Under The Pier is perfectly Ryde! It focuses on its best-known landmark, easy to find, easy to enjoy, for all ages, and above all a celebration of something unique. 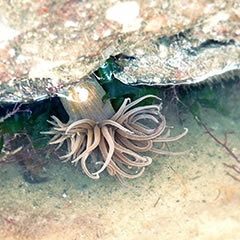 The marine wildlife of the low-tide pier is found nowhere else on the Island and is sufficiently special to bring visiting biologists throughout the year. But UTP is not dependent upon specialist knowledge for its appeal – it is a celebration of place and character. It is an undiscovered world just yards from one of the Island’s busiest entry points and Ryde’s main streets and arcades! Being Under The Pier, the sounds, light and shade, make a magical experience. 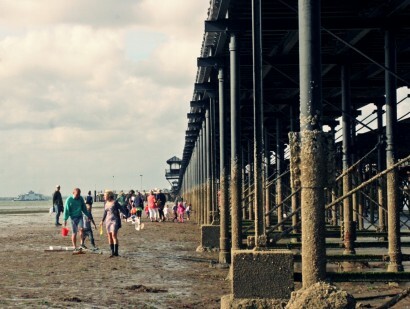 There are very few piers in the UK that have the advantage of Ryde’s long sandflats, making exploration possible. Combine this with spectacular sponge gardens and rich anemone fields that have sprung up under a 205-year old built wonder and you have a very memorable event. People at our first Under The Pier in 2014 still talk about the thrill of discovery, a familiar sight that became so new! On the day, the Pier comes to life in a new and wilder way… with ecology, art and heritage to play with, we follow the tide out, sandpooling as we go, returning to base-camp to record our finds… meanwhile back on the sand, there’s sandcasting and experiments with the Artecology makers and artists. In the run-up to the event, we and our project partners have commissioned Island artists to run a series of art workshops to help us decorate the Pier on the day. The marine wildlife images the children produced bring a splash of colour to the Pier above us, introduce everyone to the array of species they’re likely to encounter and then all come along on the day. Often, the families we meet through our green space commissions and wildplay work, such as those at Spectrum’s Lordshill estate, have come too, making special visits to the Island to join in. Every year, despite drizzle, hurricanes and one year’s fog of 2-stroke from Ryde’s annual Scooter rally, more and more people join us Under The Pier to sandpool, sandcast and explore! A major component is recording…almost every year, someone discovers a first for the area. After the event, we compile a final species list with the help of our own and other local experts which is sent to the IW Local Records Office. It’s a collective citizen science that makes a genuine contribution to the Island’s biodiversity records. Images of the day, the children’s artwork and the species tally are also displayed in Ryde Library as an all-year round reminder that you don’t need our help to discover a world of wonder under Ryde Pier but can take a look all year round at low tide. 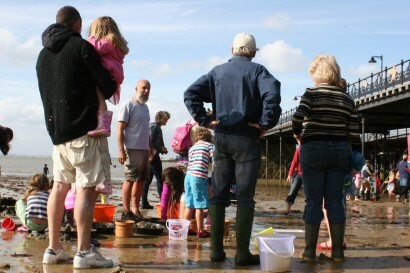 Under The Pier has been sponsored variously by Natural Wight through Natural England and Big Lottery Fund, Vectis Housing’s subsequent Wild About Wight project and Down The Coast, Heritage Lottery Funding and Ryde Town Council. Thanks to everyone for their support! Under the Pier has been a great success each year, for biological recording, for community participation, for public enjoyment and understanding, and for the Island’s reputation… we’ve supported and inspired other Island piers to celebrate their marine life and we hope to take it even further afield!